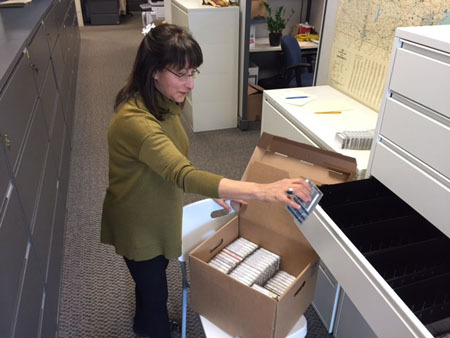 Archiving Folklore Collections: Who’s in Charge? 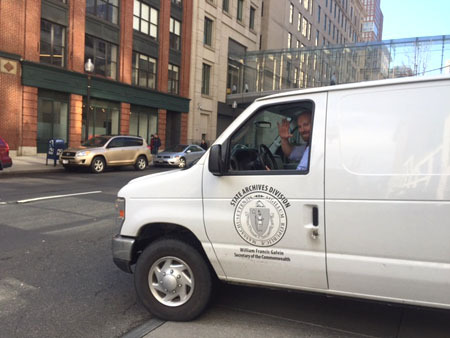 It’s been a long time in the works, but last week, the archival collection of the Massachusetts Cultural Council’s Folk Arts & Heritage Program was transferred to the Massachusetts State Archives. A little back story is in order. For many folklorists employed at state arts agencies, humanities councils, museums, and non-profit organizations, fieldwork is an ongoing part of our work. Recording in sound, image, and writing, we document vernacular music, dance, crafts, material culture, and traditional arts associated with annual celebrations and religious belief. Fieldwork is essential to curating exhibitions and producing festivals, publications, and digital media — all ways of sharing our work with the public. Field research helps us recruit grant applicants and evaluate the impact of our grant giving. The primary sources generated by fieldwork provide a unique and important record of expressive folk culture. But what happens to all these interviews, recordings, and images? My guess is that these materials are handled in a myriad of ways, many of which are not up to the standards of archival best practice. Although I’ve employed archival preservation methods, including the use of chemically inert plastic sleeves for slides and negatives and acid-free, archival grade folders for print materials, evolving technology has changed the way we collect. Caring responsibly for digitally born materials, which we began collecting in 2008, is more of a challenge. We lack trained staff dedicated to audio preservation, quality analog playback and digital conversion equipment, and large-scale information technology support. We store field-generated audio and images on writable Compact Discs and external hard drives, rather than on redundant file storage devices. Something needed to be done to safeguard our archival holdings. So a year ago, I reached out to colleagues and archivists around the country with similar collections who specialize in managing folk cultural archival collections. Folklorist/archivists Steve Green and Andy Kolovos were incredibly helpful. With their input, I sought out a mutually beneficial partnership with a repository that has both trained staff and a stated mission supporting preservation and access. Along the way, I was inspired by news of state arts agencies in Alabama, Maryland, Georgia, and Pennsylvania who were successful in brokering partnerships to guarantee preservation of their folk archival collections. By the end of the year, two repositories had come forward: The Massachusetts State Archives and the Special Collections and University Archives (SCUA) at the University of Massachusetts, Amherst. After many emails, phone conversations, and meetings, we are on our way. The two institutions will partner in digitizing, preparing metadata, and producing a multi-media finding aid for the web. I’m pleased to be working with Veronica Martzhal, Digital Archivist at the State Archives and Rob Cox, Head Archivist at U Mass’s Special Collections and University Archives. In February, I spent a few days boxing up analog and digital audio recordings, color slides, black & white negatives, digital images, and manuscript materials (field notes, transcriptions, release forms, and ephemera). Twenty boxes in all. This hybrid collection dates back to 1999, when the archive was established. 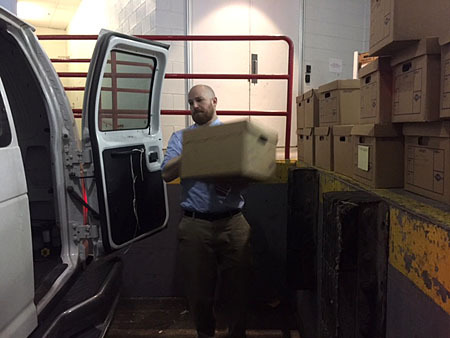 The physical transfer is the first tangible step in the process of ensuring that this unique collection of primary source materials will be professionally preserved, digitized, and eventually made accessible via a digital library. On the day of the transfer, it was Mike Farley who did most of the heavy lifting. Acquisitions Archivist Wallace Dailey oversaw the move. 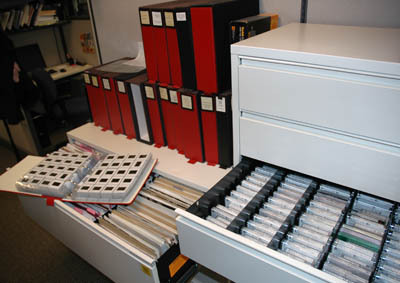 Next steps will be for State Archive staff to begin the process of digitizing the collection. The priority will be to address deterioration and format obsolescence. I plan on working with archive staff to prepare metadata for the collection in order to create an online catalog. To be continued . . . This is great news! 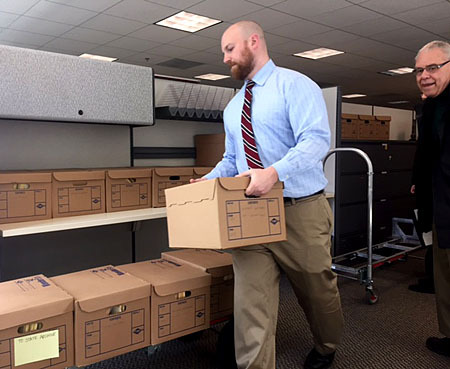 This is such important work–it takes lots of work to organize and prepare materials for the archive–on many levels. Congratulations! Congratulations ! We tried hard when I was at Illinois Arts Council but could never get this kind of partnership established, so materials are in a variety of places from the LIbrary of Congress Folklife Center to Wisconsin to some still in Illinois. Would be great to see if this can become a model other states will use.